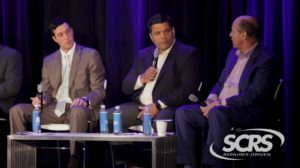 The Society of Collision Repair Specialists on Thursday released a new video of its OEM Collision Repair Technology Summit at SEMA 2018 addressing what seems to be the increasingly important trend of automaker collision repair certification. If you couldn’t make the headliner sessions of the Repairer Driven Education series, don’t pass up the chance to check out SCRS’ video recaps. The film released Thursday covers the second of three panels at the OEM Summit, “The Evolution of OEM Networks and Expectations.” The session featured General Motors customer care and aftersales collision manager John Eck, Volvo certified collision program manger Kenneth Park, Mercedes collision business manager Ben Cid and Nissan collision network growth and strategy manager Mark Zoba. It was moderated by Assured Performance technical compliance Vice President Aaron Clark, whose company manages certification for multiple OEM’s, including Zoba’s Nissan, and by Reliable Automotive Equipment President David Gruskos, whose company sells equipment OEMs require of certified shops. The four OEMs “share details of their distinct program structures and insight into how the expectations have evolved to their present state,” SCRS described the video in its newsletter. 2:05: Cid presents on the Mercedes certification program. 5:37: Zoba examines Nissan’s certification program. 16:30: Park talks about Volvo’s relatively new certification program, which started in 2017. 21:00: Eck describes GM’s brand-new certification program, which opened enrollment in August 2018. 28:01: OEMs add additional details about their networks, including program size. 31:55: The automakers discuss repair procedure expectations for certified auto body shops — and auditing of those shops. 43:32: Discussion of OEM repair procedures changing. 47:20: Oversight of whether technician or owner is undergoing training. 51:41: OEM programs versus direct repair program networks. 58:09: Automaker views on documentation. 1:01:09: Parts restricted to certified shops only. 1:02:40: Nissan on why a competing brand’s dealership can be certified. 1:04:45: GM on why certified shops need to use Mitchell. 1:08:34: Can certified shops get calibration work? 1:10:26: Automakers’ views on shop specialization. 1:15:00: OEMs talk about mitigating cost of repairs. 1:18:11: Why automakers won’t stand behind recycled versions of their parts in repairs. That panel featured Dan Black, FCA advanced body development service engineer and collision repair manager; Robert Hiser, Auto/Steel Partnership advanced high-strength steel repairability lead and General Motors body structure service engineer; Shawn Hart, Audi curriculum designer and collision instructor; and Mike Kukavica, Porsche aftersales techical training collision repair technology instructor. It was moderated by Ron Reichen, a former SCRS chairman and the owner of luxury-certified Precision Body and Paint, and Database Enhancement Gateway Administrator Danny Gredinberg, who has held Mercedes and Porsche structural credentials.